Makati, (/məˈkɑːti/ mə-KAH-tee Tagalog pronunciation: [maˈkati]), officially the City of Makati, (Tagalog: Lungsod ng Makati), or simply known as Makati City, is a 1st class highly urbanized city in Metro Manila, Philippines. Makati, Mahalin Natin, Atin Ito. Luis Jose Angel Campos Jr. According to the 2015 census, it has a population of 582,602 people  making it as the 17th-largest city in the country and ranked as the 41st most densely populated city in the world with 19,336 inhabitants per square kilometer. Although its population is just half a million, the daytime population of the city is estimated to be more than one million during a typical working day because of the large number of people who go to the city to work, shop, and do business. Traffic is expected mostly during rush hour and holiday seasons. Tradition holds that a Tagalog at a swamp on the south of the Pasig River was asked by a visitor, who was Miguel López de Legazpi, for the name of the place. As a result of the language barrier the question was misinterpreted; the Tagalog pointed to the receding tide of the Pasig River, and answered "Makati, kumákáti na" ("Ebbing, the tide is ebbing"). Parts of the city were once subject to the pre-Hispanic Kingdom of Namayan, whose capital is now in the Santa Ana district of Manila. Captain Pedro de Brito, a retired aide to the Spanish army chief of staff, is the founder and patron of the House of San Pedro. De Brito made a modest fortune in the Manila galleon trade in the 16th century. He was also a regidor of Manila, whose post was adjudged to him at public auction for one thousand four hundred pesos of common gold, with the third part of what was promised from the increase. He took possession of his post on 24 June 1589. In 1589, he acquired at a public auction a sprawling marshland measuring 4940 hectares, a part of which would become the 20th-century Makati. After his acquisition of the land, Capitan de Brito immediately took steps to "discharge the royal conscience", to fulfill, for the King of Spain, his duty to spread the Christian gospel. But he also ran into a brick wall, so to speak; the natives could not be persuaded to move inland. The Spaniards then assigned the area to the town of Santa Ana de Sapa and in the 1600s began to be developed as a pilgrimage center around the churches of Our Lady of Guadalupe (now Our Lady of Grace, opened 1625) and of Saints Peter and Paul (opened 1620) in what is today the población, built by missionary friars to attract worshippers, and also as a farming community. It became an independent municipality in 1670, and was christened San Pedro de Macati in honour of the town's patron, Saint Peter. The town was also famous for its pottery industry since the 18th century, with skilled potters trained by Jesuit priests. Its strategic location also made it a pitstop for pilgrims, travelling by foot or boat, towards the shrine of Our Lady of Peace and Good Voyage in Antipolo. Beginning in the early 19th century, the church has been directly administered by diocesean secular clergy. In 1718 the Jesuits brough the Image of Nuestra Señora Virgen de la Rosa from Acapulco Mexico to the small town, it was later enthroned at the San Pedro Macati Church where it resides to this very day, and will mark its 300th anniversary in June 2018. Until the Filipino American War, the image had an ivory head and hands and a reliquary on her breast which contained a strand of a hair of the Blessed Virgin Mary, both of them stolen and were never recovered at the same time while the church served as a hospital, and are today replaced by an oval cavity and a wooden head and hands. The city's feast days on June 29, the feast of Apostles Peter and Paul, and June 30, the feast of Our Lady of the Rose are marked with the "Panatang Sayaw", as the Bailes de los Arcos (Dance of the Arches) are called, are an old tradition going back at least to the beginnings of the 19th century as a dance to thank the city patrons for blessings received by its people and by a number of events organized by city and religious leaders. In 1851, Don José Bonifacio Róxas (an ancestor of the Zóbel de Ayala family) purchased the Jesuit estate of "Hacienda San Pedro de Macati" for 52,800 pesos. Since then, the development of Makati has remained linked with the Zóbel de Ayala family and their company, Ayala Corporation. The town was a cradle of Filipino passive resistance against Spanish colonial rule in the 1890s and the subsequent Philippine Revolution, with the participation of the local Katipunan council based in the area with Pio del Pilar, a local resident from the village of Culi-Culi, as its president. Culi-Culi is now a barangay named in honour of Del Pilar. By 1898, Spain ceded the Philippines and other overseas possessions to the United States after the former's defeat in the Spanish–American War. In 1901, the Americans declared the whole area south of the Pasig River, including the town of San Pedro de Macati, down to Alabang in Muntinlupa, a US military reservation, thus establishing Fort McKinley (now Fort Bonifacio). That same year, the whole town, with a population of 25,000, was incorporated from the Province of Manila to the new province of Rizal, with Marcelino Magsaysay serving as the town president. As the 1910s approached, the Meralco tranvia lines to Fort McKinley and to the western end of the town were built, opening transport lines for its residents and thus brought along potential investors who opened several businesses including the famous Santa Ana Cabaret at the terminus of the streetcar lines. On February 28, 1914, the Philippine Legislature passed Act 2390, shortening the name, San Pedro de Macati, to simply Makati. In 1937, the airport Nielsen Field opened in what is now the Ayala Triangle, the control tower of which still exists and is currently a restaurant. The tracks of the now Philippine National Railways reached Makatie early in the decade. During that same period, Santa Ana Park, the nation's second horse racing facility, opened to expectations from horse racing fans. After the destruction Second World War had brought upon Manila, and the subsequent closure of Nielson Field, the town grew rapidly, and real estate values boomed. The first of the planned communities (in what are now the barangays Forbes Park, Urdaneta, San Lorenzo and Bel-Air) were established in the 1950s with the efforts of its landowner, Ayala y Compañía. At the same time, Fort McKinley, then renamed Fort Bonifacio, and the then Philippine Army headquarters, became the starting point for the building up of seven more communities by military families who worked in the base area. The first office buildings were built on what is now the Makati Central Business District. Since the late 1960s, Makati has transformed into the financial and commercial capital of the country. During the terms of town mayors Máximo Estrella, Rafael Bañola, José Luciano, Cézar Alzona and Nemesio Yabut, massive development of the town took place, and foreign and local investors were welcomed to what was tagged as the nation's number one municipality at the time. Makati's central location adjacent to the city of Manila also made it an industrial hub for major national and international corporations. Partly as a result a new town hall just miles from the old one was built in 1962 just along J.P. Rizal Avenue (the old hall was later converted into the city museum). Mayor Bañola's term of office as town executive saw the building up of what is now the Ayala Center with the help of the Ayala firm, which would become the city's central shopping center of today. In 1975, Makati was separated from Rizal province along with Caloocan, Malabon, Navotas, Quezon City, Marikina, San Juan, Pasig, Mandaluyong, Pateros, Taguig, Pasay City, Parañaque, Las Piñas, and Muntinlupa, to become part of the National Capital Region as a component municipality. Following the assassination of opposition senator Benigno Aquino, Jr. on 21 August 1983, Makati became a nexus for protests against the dictatorship of President Ferdinand E. Marcos. Known as the Confetti Revolution, the demonstrations held in the central business district were led partly by employees of major corporations based in the area, culminating in the 1986 People Power Revolution that toppled Marcos’ 20-year authoritarian regime. His political rival and successor, Corazon C. Aquino–the wife of the deceased senator Aquino–became the eleventh and first female president of the Philippines. After the death of Mayor Yabut during the Revolution, Aquino appointed Jejomar Binay as acting mayor of the town of Makati; he was subsequently elected as mayor in 1988. His first term as the town executive would see the events of a 1989 coup d'etat attempt in the town's business district, and would help usher the building of the country's first skyscrapers in the early 1990s and full cityhood in 1995. On May 17, 2000 at 5:02 p.m., the Glorietta Mall located inside the Ayala Center was bombed, injuring 13 persons. According to local authorities, the homemade bomb originated from a restroom of a restaurant a video arcade. The bombing was said to be the precursor of the May 21, 2000 SM Megamall bombing and the Rizal Day bombings. On October 19, 2007, an explosion in Glorietta 2 left eleven people dead and injured more than a hundred. Initially, authorities said that it was caused by a liquefied petroleum gas explosion at a restaurant, but later began investigating the possibility that the explosion may have been a C-4 bomb. Makati is located within the circle of 14′40″ °north and 121′3″ °E right at the center of Metro Manila. The city is bounded on the north by the Pasig River, facing Mandaluyong, on the northeast by Pasig, on the southeast by the municipality of Pateros and Taguig, on the northwest by the city of Manila, and on the southwest by Pasay. Makati has a total land area of 27.36 square kilometres (10.56 sq mi). Under the Köppen climate classification system, the city features a tropical monsoon climate. Together with the rest of the Philippines, Makati lies entirely within the tropics. Its proximity to the equator means that the temperature range is very small, rarely going lower than 20 °C (68 °F) or going higher than 38 °C (100 °F). However, humidity levels are usually very high which makes it feel much warmer. It has a distinct, albeit relatively short dry season from January through May, and a relatively lengthy wet season from June through December. Makati has a population of 582,602 as of the 2015 census. Makati ranks ninth in population size within Metro Manila municipalities. 88.9% of Makati residents identified their religious affiliation as Roman Catholic. Other groups having large number of members in the city are The Church of Jesus Christ of Latter-day Saints, Ang Dating Daan, Iglesia ni Cristo, Protestantism, Islam, Hinduism, Buddhism and Judaism. Based on the city's Transport and Traffic Improvement Plan 2004-2014, the city's daytime population is estimated to be 3.7 million during weekdays, owing to the large number of people who come to work, do business, or shop. The daily influx of people into the city provides the skilled labor force that allows Makati to handle the service requirements of domestic as well as international transactions; it also serves as the base of a large consumer market that fuels the retail and service trade in the city. At the same time, however, the large tidal population flows exert pressure on Makati's environment, services, and utilities, most noticeably causing large traffic volumes along the major road corridors leading to the city as well as within and at the periphery of the central business district. The city of Makati remains the richest local government unit (LGU) in the Philippines in terms of income from local sources and on a per capita basis. As of end-2012, Makati had registered over 62,000 business enterprises, which are engaged in financial services, wholesale/retail, services, real estate, export/import, and manufacturing. Makati also boasts of having the highest number of BPO offices in Metro Manila at 1,159 companies to date, as well as the highest number of PEZA-accredited IT Parks and Buildings. The city government of Makati has not increased its tax rates since its new Revenue Code took effect in 2006. The city has been free of deficit for 26 years. The city is known for its developed business district called the Makati Central Business District (CBD). It is bound by EDSA, Gil Puyat Avenue, Arnaiz Avenue and Chino Roces Avenue. It mainly encompasses Legazpi Village, Salcedo Village, the Ayala Center, and parts of Bel-Air Village. The Ayala Triangle is a sub-district of the Makati CBD, comprising the parcel of land between Ayala Avenue, Makati Avenue and Paseo de Roxas, as well as the buildings on those streets. Many multinational companies, banks and other major businesses are located within the triangle. A few upscale boutiques, restaurants and a park called Ayala Triangle Gardens are also located in the area. Ayala Avenue and Paseo de Roxas also have the distinction of being the runways of the former Nielson Field, Metro Manila's main airport in the 1930s. The biggest trading floor of the Philippine Stock Exchange is housed in Ayala Tower One and at the old Makati Stock Exchange Building, both along Ayala Avenue. The Makati Business Club has over 800 chief executive officers and senior executives, which represents 450 of the country's biggest corporations. Most of the tallest skyscrapers in Metro Manila and the Philippines are located in Makati such as the PBCom Tower, Gramercy Residences in Century City and G.T. International Tower. PBCom Tower along Ayala Avenue is the country's tallest office building, reaching up 259 meters. It is the headquarters of the Philippine Bank of Communications, or PBCom. The PBCom Tower is an office skyscraper ranked officially as the tallest building in the Philippines since 2001. It has a total ground-to-architectural-top height of 259 meters (850 ft), with 52 stories including an 8-level radio tower. Makati is one of the most well-known shopping hubs of Metro Manila. Various shopping centers, offering both international and local retail shops, high-end boutiques, dining outlets and entertainment facilities can be found around the city. The Ayala Center is a major commercial development operated by Ayala Land located in the Makati CBD. The center is known for its wide array of shopping, entertainment and cultural offerings, making it a premier shopping and cultural district in the metropolis. It is a vast walkable complex with high-end malls that houses cinemas, local and international shops, homegrown restaurants and international food chains. The shopping malls that are located at the Ayala Center include Greenbelt, Glorietta, Park Square, and The Link. The Ayala Center is also home to 3 department stores namely, SM Makati, Rustan's, and The Landmark. Aside from the Ayala Center, the Rockwell Center is also a popular shopping district in Makati. It is home to the Power Plant Mall. The Salcedo Saturday Market and Legazpi Sunday Market are popular open-air community markets. These markets offers organic products, specialty foods, fruits, vegetables, fish, gourmet items and antiques. There is also the Century City Mall,located within Century City, located near Rockwell Center, and behind the Makati Central Business District, it is a Modern, High End Mall, and also dubbed "The Mall of Modern Makati". The University of Makati, a public, non-profit university, is the city's flagship university. Other institutions of higher education include the Asian Institute of Management (AIM), the Ateneo Professional Schools, Australian Catholic University - Manila Program, the Mapúa Institute of Technology, Lyceum of the Philippines University-Makati, Centro Escolar University Makati, Far Eastern University-Makati, iAcademy, The One School, Asian Seminary of Christian Ministries (ASCM), Don Bosco Technical Institute, Makati, Assumption College San Lorenzo, Colegio San Agustin, Saint Paul College of Makati, Our Lady of Guadalupe Minor Seminary, Asia Pacific College, Colegio de Santa Rosa Makati, AMA Colleges Makati, Inc,Palanan Elementary School. among others. Formerly known as Tejeron and constituting part of the Santa Ana-Población road, it is the first Makati road which appears on Spanish-colonial-era maps. this Japanese neighborhood can be found along the stretch of Chino Roces Avenue and neighboring streets in the area approximately between Rufino Street and Arnaiz Avenue. The Magallanes Interchange, which was conceived in 1969 and opened in 1975, was one of the first structures of its kind in the country. Located along J.P. Rizal St., the Museo ng Makati is housed in an old building, which was built in 1918 and has been used as Makati's town hall from 1918 to 1961. The museum keeps the records of Makati's history through a collection of rare photographs, murals, and dioramas. It also contains artifacts, such as the fossils of pre-historic animals and earthenware. The museum's architecture is a classic "Bahay na Bato", made of masonry at the ground floor and wood at the upper level. In 1934, during the reign of Mayor Nicanor Garcia, the structure was rebuilt using concrete materials. In 1958, while it was still used as a town hall, then Mayor Maximo Estrella had it renovated. In 1961, when the offices of the local government of Makati moved its office a few miles from this building, the old town hall was used as the Municipal Library. When the library was transferred to the new city hall compound, the old town hall was used as the Philippine Eye and Ear Infirmary. During the term of Mayor Jejomar Binay, the structure was converted into a museum through City Ordinance No. 186, enacted in March 1990. The Nuestra Señora de Gracia Church. The Nuestra Señora de Gracia Church is a baroque Roman Catholic church which was established in 1601 by Augustinian fathers. Its original architecture is a blend of the late Spanish Renaissance and early Baroque design. The touch of the Renaissance period is found in the main entrance with rose window and simple Doric columns. The interiors and the window details, meanwhile, have influences of Baroque architecture. The floor plan, on the other hand, is Romanesque. During the Seven Years' War, this church was raided by the British, an event which marks the first time that Makati was affected by a global conflict. The church was damaged due to an earthquake in 1880 and in 1898 during the early skirmishes between American and Filipino troops. The Nuestra Señora de Gracia Church is one of the most popular wedding venues in Metro Manila. Tucked in D.M. Rivera St. and surrounded by skyscrapers and residential areas, Sts. Peter and Paul Church is the oldest church in Makati, which was opened to the faithful in 1620. It was built by Jesuit priest Rev. Pedro de los Montes at a site named Buenavista through the generous donation of Capt. Pedro de Britto in 1607. The church's architectural design is a rectangular nave with apse and sacristy, which is a usual design for colonial mission churches. The façade is composed of three-tiered papal and keys, symbols of the Papacy, which was first occupied by St. Peter, one of the patron saints of the parish. This monument is dedicated to the Ilocano revolutionary Gabriela Silang. It is located at the corner of the Ayala and Makati avenues. Opened in 1969 and located along Ayala Avenue at the eastern quadrant of the Makati Commercial Center (now Ayala Center), the Hotel Inter-Continental Manila was the first luxury hotel in Makati. During its early years, it was among the top three hotels in the country - along with the Manila Hilton in Ermita and the Savoy Hotel (later becoming the Hyatt Regency) in Pasay City. It closed in 2015 and the building was demolished shortly thereafter to give way to a new development to be named One Ayala. This part of Namayan was sacred to early Tagalogs. Hagdang bató (see photo) is mentioned in chapter sixty-one of José Rizal's first novel, Noli Me Tángere, and chapter three of his second novel, El Filibusterismo. During the Revolution on 10 June 1897, Gen. Emilio Aguinaldo and about five hundred soldiers crossed the Pasig River at Hagdang bató during the march to Biac-na-bató in Bulacán. This was the first luxury movie theater and performance venue in Makati and was located south of the Makati and Ayala avenues intersection. It opened in 1960 and was demolished in 1989 to give way to the construction of the Makati Shangri-la hotel (opened in 1993) which presently stands on the site. It shared the same name as the Cinematografo Rizal located in Manila, which was the first cinema not owned by foreigners. This establishment, owned by José Jiménez, opened as a movie house in 1903 and five years later its address was recorded as 155 Calle Azcárraga in Tondo, Manila. About a decade later its address was Calle Ilaya (now Ilaya Street) and Calle Azcárraga in Tondo. This twentieth-century nightclub (photos), owned by an American named John Canson, was once advertised as being the largest cabaret in the world. It opened in Tejeros in 1921 and was in business until 1970, when a typhoon destroyed it. Famous patrons included President Manuel Quezon, Governor-General Francis Harrison, and General Douglas MacArthur. It is also said that Edward, Prince of Wales once visited it. During World War II it was converted into a garment factory, producing shirts and military uniforms for the Japanese. After the Americans returned to Makati in February 1945, they converted their famous dance hall into a temporary medical facility. It was the forerunner of fashionable discos of the eighties and nineties, such as Manila's classy Stargazer, as well as Makati's Euphoria, Faces, and Mars. Its modern counterpart is the Valkyrie Nightclub in Taguig. Opened in 1937 by the Philippine Racing Club, it was the first notable sport venue of Makati, and was the forerunner of other famous Makati sport venues where international competitions were held such as the Manila Golf Club, which located in Makati in 1948, the Manila Polo Club, which relocated to Makati in 1950, and the defunct Astrobowl Magallanes. It was larger than the San Lazaro Racetrack in Santa Cruz, Manila. During World War II it became a military storage area, and as a consequence was targeted by aerial bombardment toward the end of the war. On 9 February 1945, it was at the Philippine Racing Club grounds that the Americans, advancing from Wack Wack golf club (photo no. 26a) and crossing the Pasig River using amtracs, returned to Makati. Afterward, they built a pontoon bridge (seventh photo) which was one of two such temporary bridges they had to build after the last remaining bridges spanning the Pasig River—Banzai (Jones) and Santa Cruz (MacArthur)—were blown on 5 February. This pontoon bridge was damaged and knocked out by artillery fire on 10 and 11 February and was reported as having been repaired (photo). The Art-deco buildings of the racetrack were later used as a headquarters by US General MacArthur and also by Allied translators and interpreters. Horse racing resumed during the postcolonial period. Toward the end of the twentieth century, an increase in the taxation of winnings combined with a rise in the ownership of TV sets led to a decline in attendance, which resulted in the closure of the racetrack in December 2008 and its demolition in 2013. The Santiago Hospital was a twentieth-century medical facility in Población. Originally named Hospital Español de Santiago, it was founded in 1902 in Manila by the Spanish community as an infectious hospital for the hospitalization of Spaniards who, having to comply with sanitary regulations concerning compulsory hospitalization, preferred the services of this hospital rather than those of the public San Lazaro Hospital. Its earliest known address was 1819 Calle Azcárraga, Quiapo. In 1929, the hospital moved into its own building, an Art-deco structure in Makati, and at the beginning of the thirties was one of two hospitals in Rizal Province. By 1935, this medical facility, which had thirty-four beds, was classified as a general hospital which treated all sorts of diseases except those requiring compulsory segregation in government institutions, and by that time was admitting patients of nationalities other than Spanish. During World War II, Santiago Hospital was administered by the Sisters of Saint Paul of Chartres, and in February 1945 it had the distinction of being the only hospital in the Greater Manila area which remained open throughout the Battle of Manila. Santiago Hospital, which was once considered to be one of the best hospitals in the Philippines, closed in the 1960s as a result of the increasing urbanization of Makati. Although generally believed to be Makati's first hospital, it was preceded by a hospital in Guadalupe which existed during the First Republic. Also over a decade earlier in 1884, the Spanish briefly operated in Guadalupe an orphanage, a type of institution which in their point of view was a medical facility. In 1917, the Americans also opened an orphanage in Makati, at Casa Quinta. Makati is home to a number of fine art museums, colonial-era churches and recreation areas. Along the south-eastern border of Makati beyond Forbes Park are the Manila Golf Club and the Manila Polo Club. The Manila Golf Club features an 18-hole golf course. The Manila Polo Club counts among its polo enthusiasts some of the country's wealthiest people. The Makati Sports Club in Salcedo Village is another popular place for sports. The Makati Coliseum is another famous sports landmark in the city, where some of the biggest sports gatherings are held. The Ayala Museum is a private fine arts and history museum housing various exhibitions such as the "Gold of Ancestors," an exhibition of more than one thousand golden pre-Hispanic artifacts. Other popular museums also in Makati also include the Yuchengco Museum and the Museo ng Makati. Makati has several Spanish-era churches, such as the Our Lady of Guadalupe and the Nuestra Señora de Gracia Church (Our Lady of Grace) in the old town. At the Greenbelt Park stands the modern domed chapel of the Sto. Niño de la Paz. Between Forbes Park and Dasmariñas Village is the Santuario de San Antonio, a popular church for weddings in the Makati area. The National Shrine of the Sacred Heart is located in San Antonio Village. Makati also houses the country's only Jewish synagogue, Beth Yaacov. According to Time.com, Makati is not only the financial center of the Philippines, but also the selfie capital of the world. The University of Makati Stadium in Makati is currently home to Kaya F.C.-Makati, who currently play in the Philippines Football League, the national football league of the Philippines. There is a red-light district around Padre Burgos Street. Ayala Land and the Makati Tourism Foundation launched a year-long campaign titled "Make It Happen, Make it Makati" to increase Makati's visibility as an arts and culture destination. The campaign is part of Ayala's ongoing US$1.5 billion redevelopment masterplan for Makati, which began in 2011 and divides the city into six distinct hubs for business, lifestyle, entertainment and transport. In 2013, Ayala Land unveiled its plans for a P20-billion project that will transform the old Sta. Ana race track into a mixed-use development, featuring entertainment and sports facilities. It will sit on a 21-hectare property - the last available sprawling landbank in Makati and will be dubbed as "Circuit Makati" in honor of the Sta. Ana race track, which is part of Makati's heritage as a former racing circuit. There will be a FIFA-sized football turf which will be used for games and for football workshops. It will feature a 2-hectare open-air events ground, which can accommodate up to 20,000 people. It will have links to the Makati central business district (CBD) through Ayala Avenue Extension and South Avenue, other future road linkages or potentially even a revived Pasig River ferry service. Major roads in Metro Manila surround Makati, such as Epifanio de los Santos Avenue (EDSA), located in the southeast part of the city, the South Luzon Expressway (SLEX), which intersect EDSA at the Magallanes Interchange, and the Skyway which is built on top of the SLEX. Two of Metro Manila's main arteries pass through Makati. The Epifanio de los Santos Avenue (EDSA) pass along the city's southeast part and connects it with the cities of Mandaluyong and Pasay. The South Luzon Expressway (SLEX) runs through the city's western part and connects it with the city of Manila to the north and with southern Metro Manila. The Manila Skyway, an elevated highway built on top of SLEX, provides residents coming from southern Metro Manila a fast way to reach Makati. SLEX and EDSA intersect at the Magallanes Interchange, which is the most complex system of elevated roadways in Metro Manila. Buses plying the Epifanio de los Santos Avenue (EDSA/C-4) route from Baclaran in Parañaque to Quezon City and Caloocan pass through the central business/financial district daily. Jeepneys ply Makati's inner roads and connect the city to its surrounding towns and cities. The country's first-ever e-jeepney and hybrid bus services were piloted in Makati. The buses are parallel electric hybrids, powered by an electric motor and a Euro 3 diesel motor. The hybrid buses ply the route from Gil Puyat Avenue (Tramo/LRT-1 Taft) to Kalayaan Avenue (C-5), which are considered among the busiest in the city's central business district, cutting through other major roads like South Superhighway; Chino Roces, Ayala and Makati Avenues; Paseo de Roxas and EDSA. Other major roads in the city include Gil Puyat Avenue, which connects EDSA and SLEX in the north; Ayala Avenue, an important street that runs through the Makati CBD; and Makati Avenue, which connects Ayala Avenue with Gil Puyat Avenue, also extending north to cross the Pasig River to Mandaluyong. At the center of Makati is the Ayala Triangle, a park built on the former Nielsen Air Base. Line 3 on EDSA has four stations located in Makati: Guadalupe, Buendia, Ayala and Magallanes. The Philippine National Railways has three stations: Dela Rosa, Pasay Road and EDSA. In 2013, the National Economic and Development Authority (NEDA) worked on a feasibility study for a $1.75 billion monorail project. The proposed 12.56-kilometer elevated monorail is envisioned to connect Makati, Bonifacio Global City and Pasay through the Line 3 as well as the Ninoy Aquino International Airport. The present alignment being considered starts from the Line 3 Guadalupe Station, enters Bonifacio Global City through the north gate and ends at Ninoy Aquino International Airport Terminal 3. If approved, the monorail project can be completed by 2016. In 2015, the NEDA (National Economic Development Authority) approved the Public-Private Partnership project for the Makati-Pasay-Taguig Mass Transit System Loop which will have stations at key points in Makati namely Line 3 Buendia, Ayala-EDSA, Ayala Triangle, Makati Post Office and PNR-Buendia which was later shelved and partially revived in 2018 as the Makati Intra-City Subway which inherits most of the stations in Makati and its designation as Line 5. The city is 20 minutes away from the Ninoy Aquino International Airport. The Pasig River is located north of Makati. The Pasig River Ferry Service has two stations: Guadalupe and Valenzuela. The current mayor for the 2016–2019 term is Abby Binay, the daughter of former mayor and former Vice President Jejomar Binay. Monique Yazmin Q. Lagdameo is the city's incumbent vice mayor. The vice mayor heads a legislative council consisting of 18 members: 8 Councilors from the First District, 8 Councilors from the Second District, the President of the Sangguniang Kabataan (Youth Council) Federation, representing the youth sector, and the President of the Association of Barangay Chairmen (ABC) as barangay sectoral representative. The council is in charge of creating the city's policies in the form of Ordinances and Resolutions. Current district representatives of the city are Monsour del Rosario, representing the 1st district and Luis Jose Angel Campos Jr., husband of Abby Binay, for the 2nd district. Map of Makati; note that Makati controls the northernmost tip of Barangay Post Proper Northside. Makati is divided into 33 barangays (the smallest local government units) which handles governance in a much smaller area. These barangays are grouped into two congressional districts where each district is represented by a congressman in the country's House of Representatives. Congressional District I is composed of the barangays straddling EDSA, the barangays to the north and west of them, while excluding Guadalupe Viejo and Pinagkaisahan, while District II are to the south and east of District I, including the two aforementioned baragays. The districts used to elect the members of the city council are coextensive with the congressional districts. The official seal of Makati depicts a silhouette of the territory of Makati. At the bottom is the Pasig River, located on the northern border of Makati city. The Guadalupe Church stands on the river and is the oldest church in Makati; a reference to Spanish religious influences. Behind the church rises the modern skyscrapers, for which Makati is well known. Behind the skyscrapers are 33 rays representing the barangays of Makati. Makati's sister city is Los Angeles, California. Makati is also twinned with Ramapo, New York and Vladivostok, Russia. ^ "About Makati, Philippines". Makaticity.com. Retrieved June 5, 2013. ^ "Makati Business Club". Mbc.com.ph. Retrieved 2013-03-26. ^ "Tourist information and services on Makati City Philippines". Touristcenter.com.ph. Retrieved 2013-03-26. 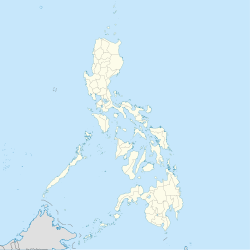 ^ "NATIONAL CAPITAL REGION (NCR) > Makati City". Department of Tourism. 2009. Retrieved 2013-05-23. ^ "About Makati City in the Philippines". Makaticity.com. 2012-11-28. Retrieved 2013-03-26. ^ a b "History of Makati City". Manila Info Blogspot. Retrieved October 1, 2013. ^ "This week in Ayala history". Filipinas Library. www.filipinaslibrary.org.ph. Retrieved 6 September 2013. ^ "History - Pioneers". Ayala Group Official Website. Archived from the original on 21 September 2013. Retrieved 6 September 2013. ^ "A record of mall explosions in RP". GMA News.TV. GMA Network. 2007-10-19. Retrieved May 23, 2014. ^ Gutierrez, Jason (2008-10-20). "Military explosives may have been used in bomb blast". Inquirer.Net. Agence France-Presse. Archived from the original on February 22, 2008. Retrieved May 23, 2014. ^ "C-4 bomb component used in Glorietta blast - PNP chemist". GMANews.tv. GMA Network. 2007-10-20. Retrieved May 23, 2014. ^ "Makati City Climate". Archived from the original on 2012-03-22. Retrieved 2011-04-25. ^ "Household Population by Religious Affiliation". City Government of Makati. Retrieved October 1, 2013. ^ a b c "Daytime Population". City Government of Makati. Retrieved October 1, 2013. ^ a b "Makati Still 'Richest City'". Manila Bulletin. Retrieved June 5, 2013. ^ "Ayala Triangle Gardens". Make it Makati. Retrieved October 1, 2013. ^ Odugbemi, Sina; Jacobson, Thomas (2008-06-13). Governance Reform Under Real-World Conditions: Citizens, Stakeholders, and Voice. World Bank Publications. p. 293. ISBN 9780821374573. ^ "Makati Shopping". Make it Makati. Retrieved June 1, 2013. ^ "Ayala Center". Make it Makati. Retrieved October 29, 2013. ^ "Makati, the City that Makes it Happen". Makati government. Retrieved 2014-05-11. ^ "Makati Guide, Museo ng Makati". Retrieved 2014-05-11. ^ a b "Nuestra Senora de Gracia Church". Archived from the original on July 14, 2011. Retrieved May 23, 2014. ^ "History". Nuestra Señora de Gracia Parish. Retrieved May 23, 2014. ^ "Makati Sightseeing Tour". Viator. Retrieved 2014-05-11. ^ "Sts. Peter and Paul in Makati". Archived from the original on 2014-05-12. Retrieved 2014-05-11. ^ Aerol B. Patena. "Experience God's presence through Makati's historic churches". Balita. Retrieved 2014-05-11. ^ "Historical and Tourist Sites and Landmarks". Makati City Government. Retrieved 2014-05-11. ^ Manila Polo Club | 100 years. Manilapolo.com.ph. Retrieved on 2011-10-08. ^ "About the Museum". The Ayala Museum. Retrieved October 29, 2013. ^ "About Us". The Jewish Association of the Philippines. Retrieved 18 August 2016. ^ Wilson, Chris (2014-03-10). "Cities Ranked by Selfies: Where Are the Most Selfies Taken?". Time. Retrieved 21 April 2015. ^ "Starter Guide To Manila Red Light District". A Farang Abroad. Retrieved 31 January 2019. ^ "Makati shows off entertainment and events side". TTGmice. ^ "Ayala transforms race track into Broadway, football hub". Rappler.com. 2013-01-13. Retrieved 2013-09-14. ^ "Hybrid buses to roll out in Ph". Retrieved 2013-06-25. ^ "Makati BGC NAIA monorail project". Retrieved 2013-06-25. ^ "Philippines' first subway gets OK from NEDA-ICC". www.abs-cbnnews.com. ABS-CBN news.com. 2015-01-15. Retrieved 2015-05-23. ^ "2010 Census of Population and Housing: National Capital Region" (PDF). Philippine Statistics Authority of the Republic of the Philippines. Archived from the original (PDF) on 15 November 2012. Retrieved 12 June 2012. Wikimedia Commons has media related to Makati City. Wikivoyage has a travel guide for Makati.